I am glad you continue to share and I know it cannot be easy. The curious and prying eyes, some whom are only that and not at all concerned or aware of the very real pain behind it... I read frequently about prison ministry (and I am not referring to a religious thing as much as a humanitarian ministry...I have no religious affiliation). I have a few books that I have enjoyed. I did my literature review for my MSN on a prison diversion program that has healthcare workers and police departments working together to attempt to keep the nuisance types of offenses committed by undertreated mentally ill individuals out of the prison system and funnel them into a system more in tune with their unique needs. I had no idea how awful for-profit prison systems are until I did my literature review. I had no idea how much of our inmate population is made up of the mentally ill and how completely detrimental the environment and how totally at risk they are there. I also had no idea how many good souls end up on the inside, behind bars, for a one-time mistake or lapse in judgment. This is verbose and I apologize. I just wanted you to know there ARE people out there who have no connection to the prison system watching with concern and wanting to do more. I am sending you love and light. I think you have a new crush, can't stop thinking about him or her and this is another chance to examine the relationship because you are all alive with NRE (New Relationship Energy). Just go with it and see what happens. Life is short. I kissed a lot of guys in my single days and I still wish I had kissed more. Everyone knows once the hormones of NRE kick in it won't matter what anyone says about whether or not its a good idea. Unless it gets in the way of you being a decent coworker, nobody really cares. I am trying. Really really trying. My husband tells me how trying I am all the time. This has nothing to do with nursing other than that your friend is a nurse. If you knew about this behavior and have done nothing up to now, you are just as much in trouble with the moral compass issue. 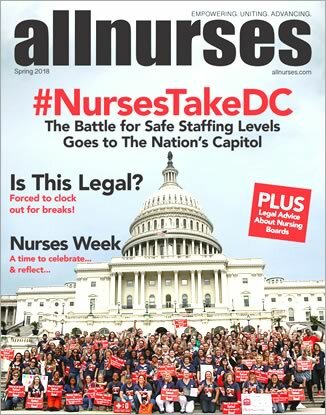 If you are a nurse you also are in trouble from a legal standpoint. In the future I would advise you choose your 'friends' more carefully. Yeah, I think you would be hard pressed to find a woman anywhere who has not experienced this. I keep a stash in my desk. If you have a locker, you may wish to do the same. Heck, I have a small pharmacy - pain meds for cramps, pads, tampons, chocolate, etc..... Not one woman will think worse of you for this! In fact, your having asked automatically makes you a "safe" person to ask should the situation ever be reversed. Please nip this in the bud now. Do NOT go on that date or go on it ONLY to make things clear. It will only get worse if you lead her on further. I know it is no fun breaking someone's heart but sometimes hearts have to be broken. It will get massively worse if you kiss or, goodness forbid, sleep together. You need to tell her honestly that you think she is great to work with but that you aren't interest in a relationship and you didn't mean to lead her on. No need to put "because we work together" on the end of that or any other justification. She misinterpreted things. Respect her enough to tell her so, even though it will be hard. Don't tell her at work. Don't tell her over text. Don't text outside of work. Don't friend on Facebook. Don't do anything that can be construed as this being more than a work relationship. And then learn. Learn from this. If things go south after (and they will to some degree, at least temporarily, most likely), then schedule your shifts on different days than hers as much as possible. Hmm. I can't really make out what you are trying to say here, but the gist of it is a nurse broke your heart I think. Not really pertinent to this board other than a cautionary tale against dating in the workplace. I hope you heal and recognize people are people and all sorts of people are nurses. This one encounter is not representative of what a professional and collegial relationship will look like. Chalk it up to a lesson learned. Don't date at work. It pains me to say it, but this. My "job" would no longer pay me anyway. It isn't as if they have cash sitting around and the world would quickly turn into a barter system. Law and order would be devastated. Looting, murdering, every-man-for-himself would swiftly take over (within a day or three) and those in the hospital are pretty much doomed. Medical care as we know it would cease within days....medications would rapidly run out, as would supplies, oxygen tanks, water, food. It is likely people would storm the hospital looking for meds, shelter, assistance with chronic illnesses that until now were able to be managed with medications that they no longer have after however much they happened to already have at home runs out. I would go home to my family, make whatever plans we can. My youngest son would be dead within a month due to medications he needs being unavailable anymore. I would go home and grieve and do the best we can with whatever time we have left. We are in the suburbs and I don't imagine we'd make it very long. I am 43 and thankfully pretty well set financially. I couldn't retire next year or anything, but if I want to retire in my 50s I should be able to without having to really change my lifestyle. That being said, I can't imagine wanting to retire that early right now. I am sure my perspective will change as my kids move out and my body really starts to age, but having come into nursing later in life, it really is my personal fulfillment on a lot of levels. The key for us has been careful money management and sound investments. We lost our shirts in the downfall a few years back as well as several jobs. Thankfully our conservative living meant we didn't have to change our standard of living through those events. Now we are fully recovered from the losses in our investments and back to making decent money after recovering from the years of frightening unemployment. Hoping others are starting to see things picking up for them as well. Going through that taught us a lot about what we are willing and not willing to spend money on. This in turn has helped our savings add up fast now that we are both earning a decent living again. I would urge you to consider the impact on the kids if you go to war against their mother. You have been wronged in one of the most devastating ways possible. They, however, are innocent. please get an attorney and a counselor. Take good care of yourself and your children. Getting through this while protecting them (and you MUST protect them) will require reserves you never knew you had. I am so sorry for your pain. It is a stretch to think people are "approving" of Ruby Vee due to veteran status on this board. I have personally never met the woman (or who I assume is a woman...I would not know). She did not "make fun". She utilized a literary style known as "satire" and, frankly, did it quite well. I will own that not everyone can appreciate it and I myself might find my face red to be utilized in it. Wikipedia defines satire as follows: Satire is a genre of literature, and sometimes graphic and performing arts, in which vices, follies, abuses, and shortcomings are held up to ridicule, ideally with the intent of shaming individuals, corporations, and society itself, into improvement. Although satire is usually meant to be humorous, its greater purpose is often constructive social criticism, using wit as a weapon and as a tool to draw attention to both particular and wider issues in society. Shakespeare utilized it not infrequently to poke at members of aristocracy. However, it is a valid writing style that has nothing to do with "neener neener" playground antics and it has nothing at all to do with the subject matter.